Chigiriki: This deadly weapon consists of a chain 3 to 10 feet in length with a lead or cast iron weight at one end. The other end is attached to a staff which varied in length. It was used to ensnare a sword or to entangle the opponents legs or arms, or hit the opponent with the metal weight at the end. 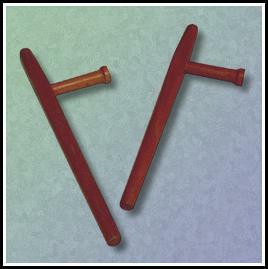 Fukiya: Poisoned pins or darts shot through blow guns, used by the ninja. Jitte: A jitte is a metal fork of sorts, used to catch and disarm swords. 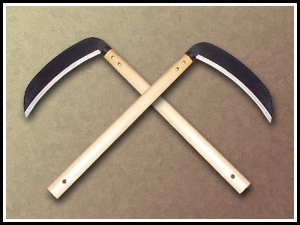 Kama: Kamas or sickle were originally and still are farmers tools. They were made into weapons by ninja. They are usually wielded in pairs. Kanzashi: These are sharp pointed ornamental hair pins used by the women of feudal japan for self-protection. The sides were spoon-shaped and usually contained deadly poison. Kusari-Gama: The kusari-gama is basically a kama with a three foot chain attached to the base of the handle. The chain usually has a weight at the end. This is also a ninja weapon. Kyoketsu Shogei: This is what the real "Ninja Grappling Hook" was. It had a pointed metal hook attached by an 17 foot rope to a metal ring. Metsubishi: This was blinding powder used by the ninja to blind an opponent momentarily allowing the ninja to escape. 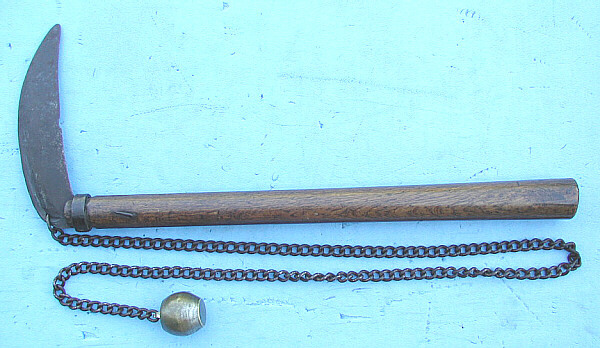 Manriki: This is a chain weapon about two and a half feet long with one metal weight on each end. The above picture is of kusari fundo, there is also another type called manriki gusari witch have smaller weights. An interesting note about the Manriki was that it was especially popular with the palace guard of Japan, because it was sacrilege to spill blood on palace grounds, but the chain could strike, strangle and entrap without wounding. Nage teppo: An early hand grenade usually thrown into enemy encampments to cause damage and confusion. 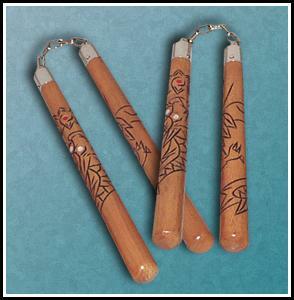 Nunchaku: This was originally intended to be a wheat flail. It has two 2 foot hardwood pole attached by a foot long chain or rope. Ono: The ono is a pole axe about six foot in total length, with a very large axe head, it was used mostly by the yamabushi or warrior monks of japan. 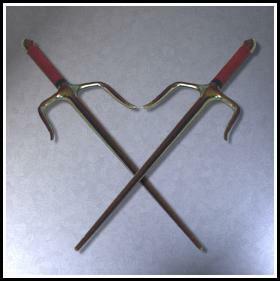 Sai: The sai is a two pronged knife used to catch weapons and pull them out of their wielder's grip. It is usually not sharpened and a more defensive weapon. 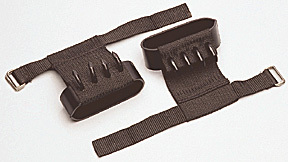 Shuko: Shuko or "Ninja claws" are nasty weapons used to cause nasty lacerations on your opponent. Against popular belief climbing was only a secondary use. Shuriken: Shuriken a.k.a. the ninja star or Chinese star, was the throwing weapon of the ninja there are many variations and usually there was a "clan shuriken" that was kind of like a signature or trademark of a particular clan. Shuriken were usually dipped in various poison by the ninja. Tessen: The tessen is a metal fan, there are two types one which is solid metal, and the other witch has metal strips, with canvas or fabric in between that folds out into a fan. The folding ones sometimes had razors lining the outer edge so it could be used to cut. They were also used by samurai to signal commands during battle. Tetsubishi: Tetsubishi are the caltrops of the ninja, they were used to aid in the ninja's escape or cause a distraction. Tonfa: The tonfa was originally a handle to a grinding wheel, now it is used by police forces everywhere :) The tonfa is your standard billy club or night stick. Torinoko: Firecrakers shaped like eggs, used by the ninja to surprise the enemy with a loud noise.